Polish Folk Fashion: Pure Joy! The Polish national wardrobe is filled to the brim with embroidered dresses in all possible colours, Gorals*, hard-soled leather moccasins called kierpce, and ornaments that include red beaded necklaces and fancy peacock feathers from Krakow. Hanging next to stripy woollen and felt attire we find the finest silk, cashmere and colourfully threaded ornamental lace. We want to show national costumes not as a costume for the stage or a piece of fabric placed in a cabinet, but as a piece of clothing worn centuries ago by ordinary people in their everyday life. Let's venture into the hundred-year-old wardrobe and unveil the most beautiful outfits. Legend has it that the costume emulated the ornamental gate of Jan III Sobieski's Palace in the Warsaw district of Wilanow. 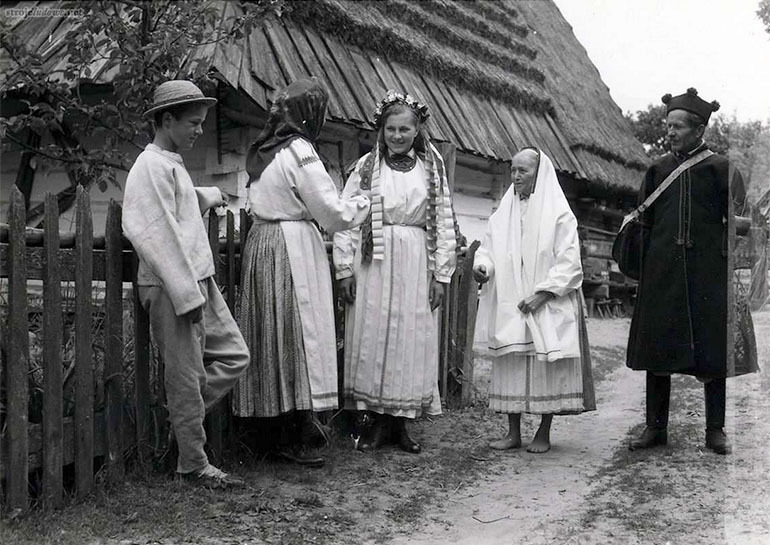 A typical dress for this part of the Mazowsze region, the Wilanow costume boasts beautiful black embroidery that decorates the top part of the white sleeve of female shirts – an arrangement picked up by young ethno-designers. Ankle-length skirts were covered by slightly shorter aprons of white, blue, green or different shades of yellow. Pastel-coloured silk ribbons were braided into the hair and beaded necklaces. Maidens would wear their braided ponytails up in a crown, while the married ladies would wear a white, embroidered linen coif head scarf. Men completed their look with tall top hats and felt hats. The Krakow costume owes its fame and national status to the leader of the 1794 Uprising, national hero Tadeusz Kościuszko, who hid from Russian spies by dressing 'like a peasant' in the Krakow costume. Wishing to underscore the role of the infantry charge of peasant volunteers (kosynierzy, scythemen) in the victory at Racławice, Kościuszko took an oath of loyalty to the nation on the Krakow market square wearing a white sukmana. Kościuszko's popularity greatly contributed towards the diffusion of the Krakow costume throughout Poland. National dress expert Jadwiga Koszutska describes how some elements, especially the sukmana and the special caps called rogatywka (a peaked cap), were introduced into the uniforms of 19th century national insurgents. On the other hand, the female Krakow costume spread thanks to the Krakow intelligentsia from the Młoda Polska / Young Poland circles. Peacock feathers pinned to hats, white aprons, stunningly embroidered silk corsets and red beaded necklaces became trendy. In the second half of the 19th-century, there was a preponderance of red fabrics with thin individual strips or in beams. 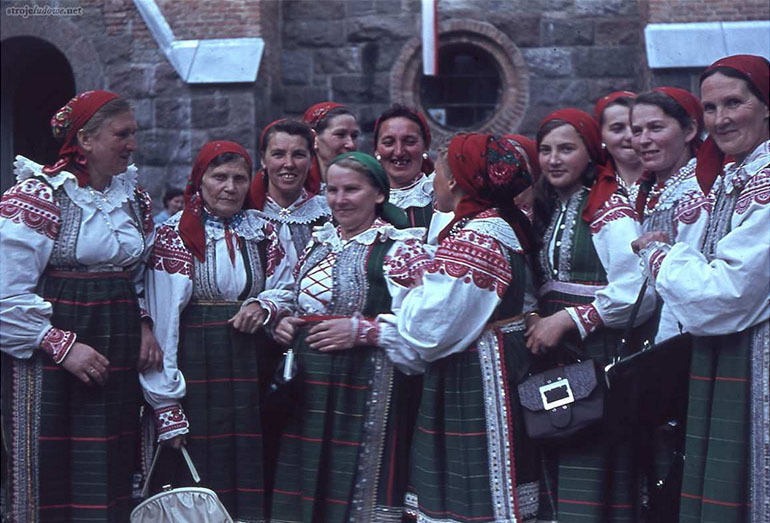 The beginning of the 20th-century marked the time of the transformation of the Łowicz costume. The strips were set against an orange background and the green coloured strips were diversified and enriched through the addition of vermilion, white and violet. The most important changes however, especially for the female costume, took place during the interwar period. The striped cloth colour palette was taken over by colder shades: greens, violets, emerald colours obtained with aniline dyes. 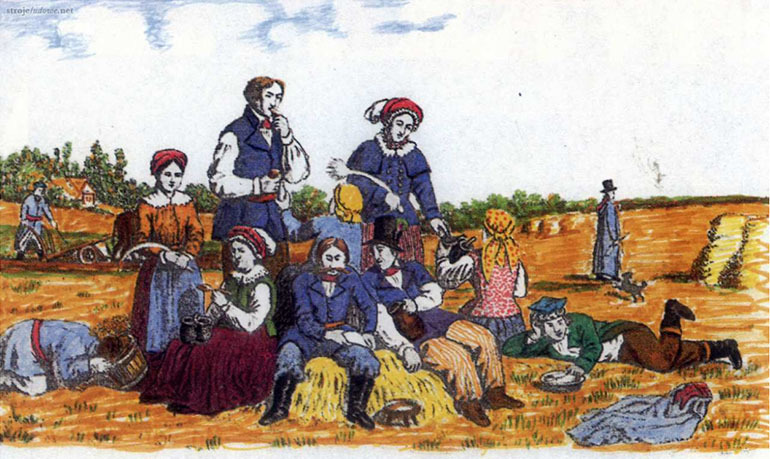 The variety of the fabrics, their diverse colours and undoubted beauty encouraged the spread and imitation of the style , the so-called Łowicz fashion to other regions. Not all of the original elements of the costume of the Kujawy region survived. We can be glad that different artists have represented it in their works. The most complete representations can be found in Wojciech Gerson's works from the mid 19th-century. The landscape painter's art was used by Oskar Kolberg for the latter's illustrations to the volume 'Kujawy' from 1867. 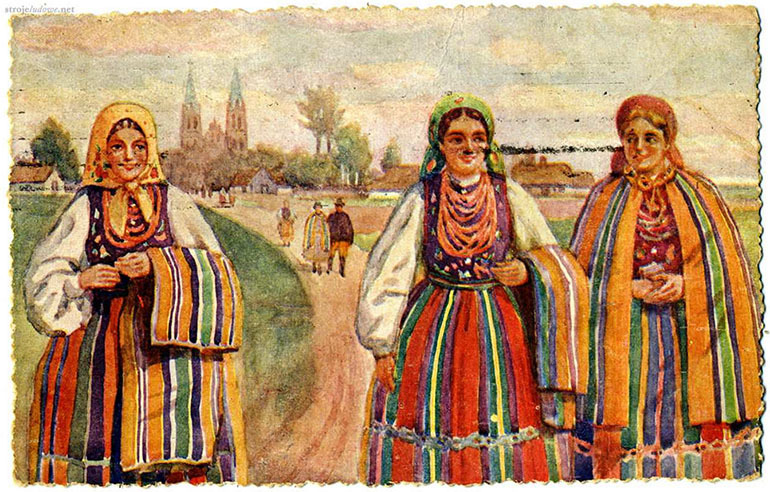 For years, the famous folklore-loving interwar painter and fabric designer Zofia Stryjeńska shaped the image of the Kujawy costume with her art. We can quickly recognise the Kujawy costume by looking at the original headpieces – a fur hat tied at the side, shepherd hats with wide brims, peaked caps and cheekily sideways worn caps with a distinctive visor. Add a linen shirt and a silk scarf tied at the neck for the gentlemen. The maidens' Sunday dress included scarves, while those who were married would adorn their heads with headpieces called kopki decorated with scarves. Women completed their outfits with a corset, a sukmana, a skirt, an apron and the obligatory jewellery. Modest and devoid of ornaments – that was the typical male costume of the Kurpie region of green and white primeval forests. Starting with the head, a peaked cap called rogatywka, a hat from braided pine roots with a patented visor, was the height of fashion. In the heat of the summer – a so-called maciejówka cap made of broadcloth like the ones worn by Józef Piłsudski. Clogs would be worn on wrapped up feet or boots with boot-tops (a symbol of status). The most expensive piece of the men's attire would be the brown sukmana and a sheepskin coat with a black sheep fleece collar in winter. Let's not skip over the gadgets – the beekeeper and farmer's Kurpie costume was completed with elegantly carved oak canes, birch or amber pipes, stylish snuff boxes made of horn and sacks made of badger skin. 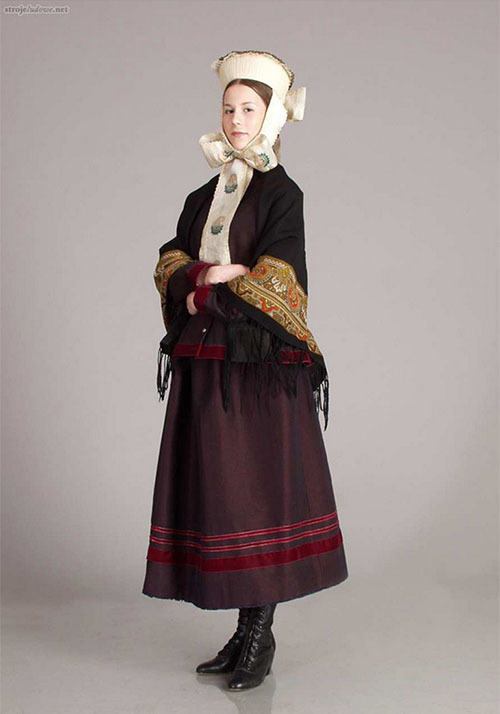 Simple yet stately, the Warmia region female costume was particularly apt at underlining female attributes. The wide, frilled, three-metre-long dress was made of velvet or silk and worn with a cap elaborately embroidered with real gold and silver. These caps, tied at the chin, were real laced masterpieces, to say the least. They were usually sewn by nuns and could only be worn by married women. From the information on the Dom Warmiński website, we discover that the headpieces differed in shape, embroidery and decoration. The complexity depended on the owner's age, wealth and the occasion for which the headdress was worn. Those with a particular fondness for fashion would add splendour with a pair of earrings or by doing their hair up with hairpins (called harnatle). 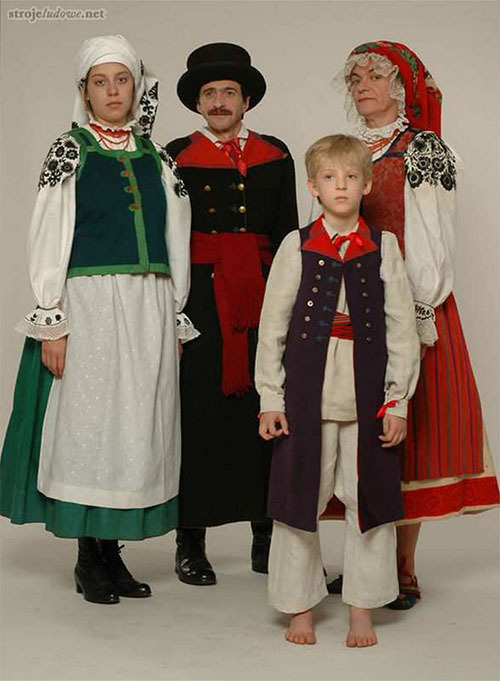 The Warmia region costume ceased to be widely worn already at the end of the 19th-century. The female dress was used longer, while its male equivalent has passed into oblivion. The fashion of Cieszyn, a multicultural city where several important trade routes meet, is rooted in the Renaissance. The sophisticated female costume was chiefly made of high-quality and costly fabrics, complete with gilded embroidery and precious jewellery. Making the outfit even more 'glam' were round or heart-shaped pins used to fasten the collar of the typical white shirt (a kabotek) and the silver Cieszyn belts which had delicate chains (trzepotki) attached to them. All the ornaments were cast and designed by goldsmiths from the Cieszyn region. Here is an example of a particularly modest costume: simple, made independently, usually using linen or wool. The style almost completely disappeared from the Biłgoraj landscape during the second World War. 'The female costume was archaic and unique, it reminded of the literary and artistic image of the Slavic costume', strojeludowe.net discloses. It composed of a shirt, a skirt and a linen apron. As per usual, the most sophisticated elements were the headpieces – bonnets with ribbons flowing down till the waistline, fastened on wooden rims for the married woman. A so-called 'oberki' under the headscarf was worn at the turn of the 20th-century. Finally, pink coloured beaded necklace adorned their necks. The most characteristic part of the male costume was a sack in the shape of a horseshoe called a 'kalita' and was worn mostly on holidays, always on the right shoulder. 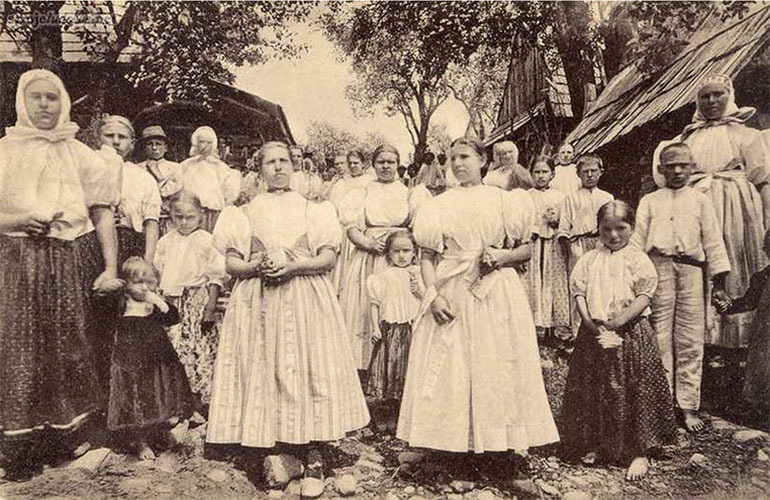 *The Goral people (Polish: Górale, literally 'highlanders') are a group of people indigenous to the mountains areas of Poland (Tatra Mountains and parts of the Beskids), Slovakia, and the Czech Republic. Return to top. Sources: strojeludowe.net, Fundacja Braci Golec , Muzeum w Łowiczu, polskatradycja.pl, 'Strój górali podhalańskich', Państwowe Muzeum Etnograficzne / National Ethnographic Museum, Muzeum Pałac w Wilanowie / Wilanow Palace Museum, Dom Warmiński, Muzeum Tatrzańskie, 'Polskie stroje ludowe' published by Muza.